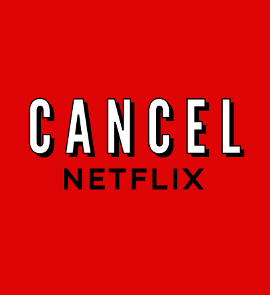 A few weeks ago we put out a call: if you care about freedom on the Web, cancel your Netflix subscription. The company has been leading an aggressive lobbying effort to change the fundamental language of the Web (HTML) to add an official extension accommodating Digital Restrictions Management (DRM). Free software supporters and the blogosphere have responded strongly to our previous posts about this attack on Web freedom, and many (like @jordiburcas above) have canceled their accounts. Now we're asking you to take this to the next level by dumping any stock you own in the company. Netflix's plan is to hijack the standards-setting power of the World Wide Web Consortium (W3C), the body that coordinates the development of HTML, in an attempt to make it easier to distribute media with DRM. Netflix's proposed extension to HTML, called Encrypted Media Extensions or EME, is supported by software companies like Microsoft and Google, as well as the powerful media corporations that provide the primary impetus for DRM. This cabal supports DRM because it gives them control over Web users. By adding artificial restrictions to media, they are able to corral people into their outdated business models and revoke customers' access to media (even media they have paid for) when it suits them. As if we didn't already have reason enough to oppose this scheme, the proliferation of DRM inherently makes it harder to use free software. EME would indubitably lead to an explosion of DRM-encumbered media on the Web, restricting our freedom and pressuring users to install proprietary software to satisfy the demands of digital restrictions. For those committed to freedom and unwilling to install this software, DRM-encumbered sites would create a growing dark zone on the Web. Dump your Netflix stock and post about it to inspire other shareholders to join you. If you're still holding on to a Netflix membership, cancel it for a double whammy and post with the hashtag #DivestNetflix*. Even if you don't own Netflix stock or have an account, you can help by spreading this message to the many others that do. This is a pivotal moment in the W3C deliberations over EME, when its proponents are struggling to maintain the illusion that EME won't cause any problems for the Web. Also, despite previous hype, Netflix recently released new subscriber numbers that were below expectations for the second quarter of 2013. These facts mean this is a critical time to send a message by divesting. We should also remember that this is part of a larger struggle for freedom and control over our media. The world is in the initial stages of a great transition from locally stored to remotely hosted media. This shift will come with more opportunities for media distributors to encumber their products with DRM, and we need to demonstrate from the outset that doing so will cost them our support as customers and investors. That's why we're asking you to join the movement and divest from Netflix. You can view this post online at https://www.defectivebydesign.org/divest-from-netflix.